You’ll enjoy uninterrupted views from 22015 Whitewood Drive W with views from the Sleeping Giant to Hahn’s Peak and the Steamboat Ski Area. This amazing building site in Whitewood Subdivision has uninterrupted views from the Sleeping Giant to Hahn’s Peak and the Steamboat Ski Area. The 7.6 acre property already has a spacious 2 bedroom caretaker residence over the 3-car garage and is ready for the owner to build a main residence. 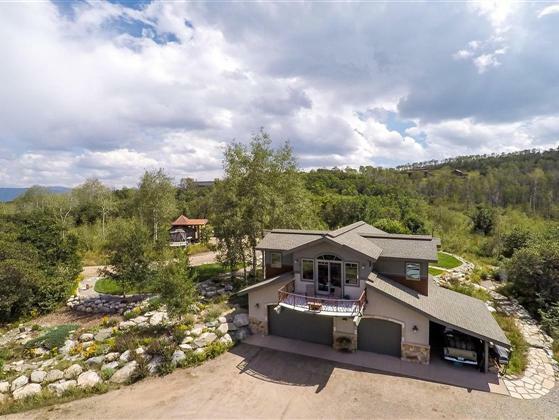 Designed and built by a custom home builder with the utmost attention to detail, the property was thoughtfully planned-out with an oversized septic system and an excellent water system already in place for the future main home. Enjoy the evening alpenglow from the back covered porch or one of the many outdoor living areas designed by a landscape architect. Stroll through the irrigated lawns and flower beds, a flagstone patio, fire pit, and a backyard yurt. Storage will never be a problem with the oversized 3-car garage, carport and a reclaimed barn wood shed. Seclusion is guaranteed as this retreat also borders 640 acres of state land while being just a 15 minute drive from the Ski Area.